Green is now everyone's favorite color. Design products with future generations in mind. Consumers are increasingly sensitive and concerned about sustainability. Indeed, a recent study of purchasing habits shows demand for sustainable offerings remains strong - despite the economic downturn. According to a Cone Consumer Survey (February 2009), 44 per cent of consumers say their 'green' buying habits remain unchanged despite the current economy, and one-third of consumers say they are even more likely to buy green today than they were previously. Sustainability is not a passing fashion, and people are constantly searching for more information, products and innovations in this area. 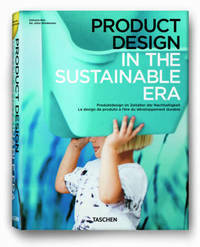 Designers, in turn, are responding with elegant, efficient, low-impact products that look towards a sustainable future. This book brings together over 100 such innovative and award-winning projects from over 20 countries, launched by leading design offices and companies worldwide, including IDEO, IBM, and New Deal Design. Featuring reusable products from water bottles and diapers to solar- and wind-powered goods; clocks that run by reacting with soil; air and water purifiers; coffins and urns for sustainable funerals; paper made from elephant and sheep dung - as well as eco-friendly chocolates, bikinis, guitars, energy efficient appliances and much more - this is a state-of-the-art update on the sustainable revolution in product design. Julius Wiedemann was born in Brazil, studied graphic design and marketing, and was an art editor for digital and design magazines in Tokyo. His many TASCHEN digital and media titles include Animation Now!, Advertising Now! the Web Design series, and 1000 Favorite Websites. Dalcacio Reis was born in Brazil and trained as a product designer in Rio de Janeiro before joining Ana Couto Branding & Design, one of the region's top branding offices. After managing several projects in Latin America, Reis pursued an MBA in Sustainable Business, in order to help shape a new era of product development and consumer behaviour.